These truffles are inspired by the dark chocolate truffles served with coffee after lunch at Le Flore en l’île, a beautiful restaurant and tea salon on the Île Saint-Louis with a magnificent rear view of the Cathédrale Notre Dame de Paris (and those flying buttresses!) They also happen to resemble those from the legendary chocolate makers at La Maison du Chocolat. Known as les truffes in France, they are so named due to their resemblance to the savory truffle. Place the chopped chocolate in a heatproof bowl. Scald the cream, and pour over the chocolate. Cover, and let sit 10 minutes until melted. Prepare a large bowl of ice water. Add the softened butter, honey, and vanilla paste; stir until well blended. 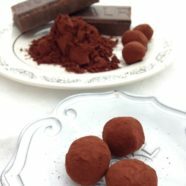 Set the bowl of chocolate in the bowl of ice water; stir, scrapping sides continuously, until chocolate is just firm enough to shape into small balls. Remove from ice water. Place the cocoa in a Ziploc bag. 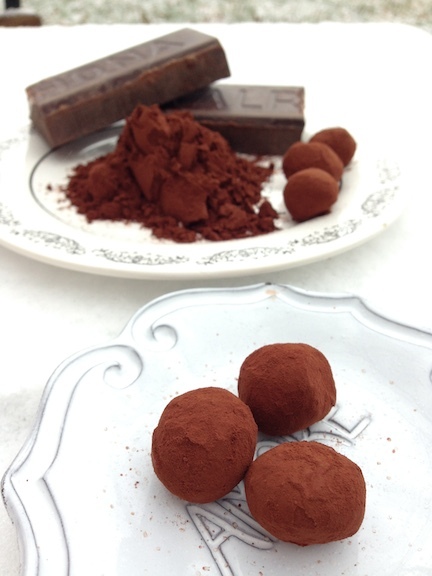 Shape the truffles into ½-inch balls, and drop into the cocoa (several may be done at once). Gently rotate bag until truffles are well coated, and place on a baking sheet lined with waxed paper. Chill in the refrigerator for at least 30 minutes (and up to overnight). Shake baking sheet to remove excess cocoa. If desired, gently roll truffles in paper towels to eliminate further excess cocoa. Package in ¼-ounce bags and keep chilled. Truffles will keep 2-3 weeks. Sources: Arizona Vanilla Company, a specialty purveyor of high quality vanilla beans, pure vanilla extracts, pure ground vanilla, vanilla paste, and more.